Members of Congress reportedly urged Gowdy to run for the chairmanship after Chaffetz announced several weeks ago that he would retire from Congress. Gowdy's spokeswoman did not confirm the congressman's intent to take Chaffetz's post, but lawmakers reportedly said he would win if he ran, Politico reported on Thursday. 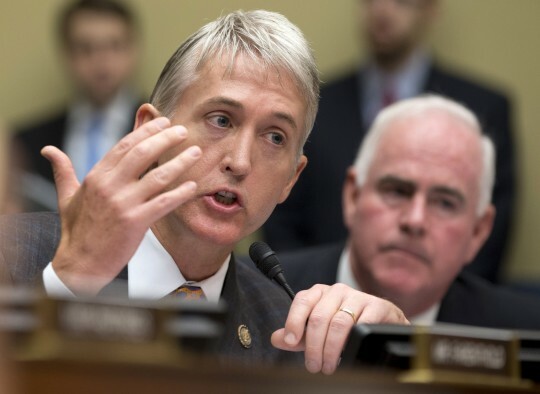 Gowdy ran the House Select Committee on the investigation into the State Department's handling of the 2012 terrorist attack in Benghazi. News of Gowdy's prospects came after he denied a request from Attorney General Jeff Sessions to serve as FBI Director. As chairman, Gowdy would lead the House's oversight of President Donald Trump and investigate whether the president attempted to quash an FBI investigation into former national security advisor Michael Flynn. "Trey is more than qualified to be the next chairman of Oversight," Rep. Tom Graves (R., Ga.) said. "He has a lot of support from our conference, and given the responsibilities that come with the position, and his past pedigree [as a prosecutor], he’s perfect for the job," he added. This entry was posted in Politics and tagged House of Representatives, House Oversight and Government Reform Committee, Jason Chaffetz, Trey Gowdy. Bookmark the permalink.